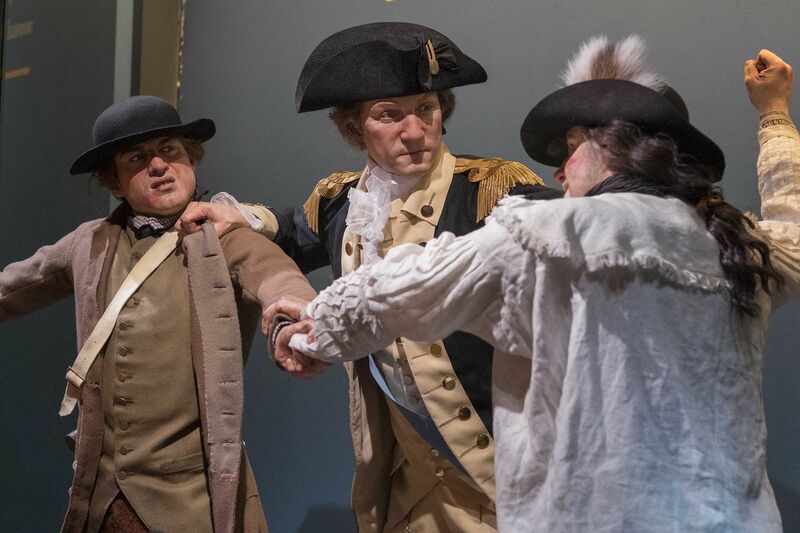 George Washington breaks up a brawl in Harvard Yard in one of the Museum of the American Revolution's incredibly lifelike tableaux. It wasn't just a bunch of white guys in powdered wigs lining up and inviting opponents to shoot them. In fact, it wasn't just a bunch of white guys at all. The American Revolution involved people from all strata and races, men and women, all interacting in extremely complex and often poignant and surprising ways. But how do you convey that? That's the question R. Scott Stephenson, vice president of exhibitions and programming at the Museum of the American Revolution, kept asking himself. The museum was handicapped by the absence of photographs, Stephenson said, "which are a powerful way of connecting with humanity." A key part of Stephenson's answer has been to make liberal use of lifesize figures engaged in real events -- incidents that happened and were recorded in diaries and letters but that were never subjects for artists. "They are almost a three-dimensional illustration," he said of such tableaux. "They raise questions that get you to engage." The remarkably lifelike figures are molded in resin from casts of models' bodies and faces, then painted, given hairstyles, and clothed. One tableau features London Pleasants, enslaved by a Quaker family on a Virginia plantation. Traitorous Benedict Arnold, by then a brigadier general in the British army, sailed up the James River in 1781 on his way to attack Richmond, and he offered freedom to all enslaved people who joined up with the redcoats. Pleasants took him up on the offer. The tableau features Pleasants in his British uniform -- he became a trumpeter in Arnold's regiment -- urging a boy and a woman to flee to the British and freedom. The story effectively presents a little-known aspect of the war and draws visitors directly into the lives of those involved. Another tableau includes Gen. George Washington seeking to break up a brawl that began as a snowball fight among his troops in Harvard Yard. The scene vividly illustrates rancor among residents of different colonies. The fighting men did not feel an allegiance to some kind of "nation." Another scene depicts the wartime reunion of James Peale, who had fled New York with the rest of Washington's routed army, and his brother, Charles Willson Peale. There are also tableaux of British cavalry officers, members of the Oneida Nation, and colonial prisoners of war held at Independence Hall. Many stories throughout the galleries share details provided by the diary of Elizabeth Drinker, a Philadelphia Quaker who wrote vividly of life in the city and surrounding region. The mock front of her house looks out over one gallery, and visitors may peer inside at the kinds of household furnishings that were confiscated by angry colonials who suspected neutral Quakers of harboring secret loyalist views.